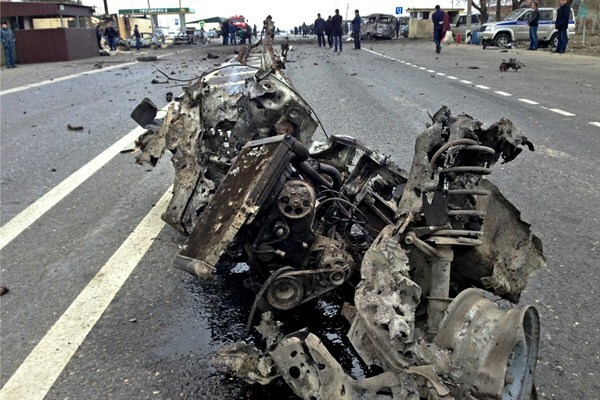 The wreckage of a suicide bombing near a police checkpoint in Russia’s Dagestan republic, Feb. 15, 2016 (NewsTeam photo by Bashir Aliev via AP). Russia’s North Caucasus insurgency has gone relatively quiet, but reduced casualty numbers belie a still-worrying situation where long-standing grievances remain. As more and more fighters join the cause of globalized jihadi groups, most of all the self-declared Islamic State (ISIS), Moscow may find that it has only transformed and widened its war.